The new elementary school is designed to maximize energy efficiency, with solar panels and a wood-chip boiler. FALMOUTH — Workmen and teachers are putting the finishing touches on the new Falmouth Elementary School, which is scheduled to be completed before students return Sept. 6. With a projected enrollment of 877 students, it is by far the largest elementary school in Maine, according to the state Department of Education, surpassing many high schools in the state. The $37.7 million project cost $8.3 million less than expected, largely because of a slow economy and construction industry. Cody Mros of Salmon Falls Nursery in Berwick prepares a flower bed on one of the green rooftops of Falmouth Elementary School. The new school completes the town’s effort to create a single campus on Woodville Road, where the elementary school is nestled between Falmouth Middle School and Falmouth High School. “I love, love, love having one campus,” Superintendent Barbara Powers said during a recent tour of the new school. Now, Powers and other administrators can simply cross Woodville Road from the superintendent’s office to visit any of the schools. Their proximity also makes it easier to share teaching staffs, educational programs, student mentors, school facilities and athletic fields. The new school replaces the Plummer-Motz and Lunt elementary schools on Lunt Road; town officials plan to seek proposals to sell or lease all or part of that 20-acre property to developers. With the new school, the district was able to remove 40 portable classrooms that were used at the elementary schools and the middle school. The new school will have 109 staff members, including 29 educational technicians. The middle school, which no longer has fifth-graders, now has 515 students, and the high school has 728 students. The state funded 84 percent of the new school, or $31.7 million. Town voters decided by referendum to pay $6 million in additional costs, including a new artificial turf athletic field, some green design elements and student project rooms. The building is designed to be certified by the U.S. Green Building Council for energy efficiency and environmental sustainability. It includes a geothermal heating and cooling system, two rooftop gardens, solar hot water panels, porous pavement to reduce stormwater runoff, window systems to intensify natural light and a wood-chip boiler to maximize heat energy. 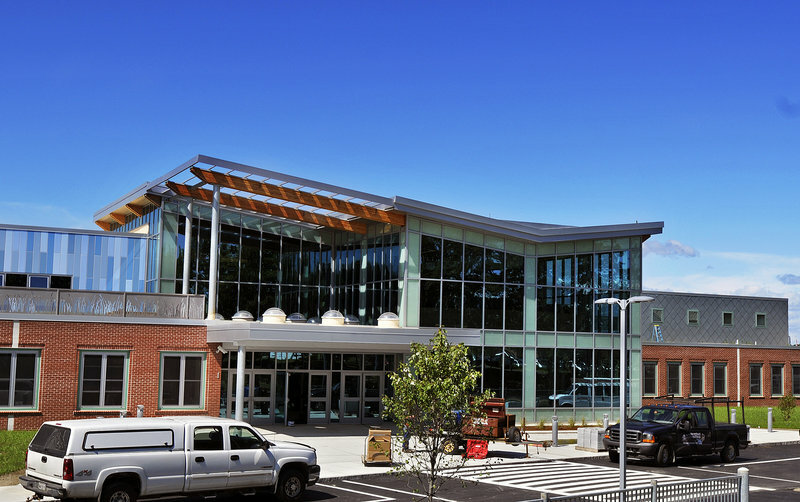 Designed by Oak Point Associates of Biddeford and built by Shaw Brothers Construction of Gorham, the new school features natural building materials and decorative motifs that were selected to make its 147,000 square feet seem less intimidating to young students. “We wanted it to feel like a friendly place for little kids because it’s so big,” said John Flaherty, who is co-principal with Karen Boffa. 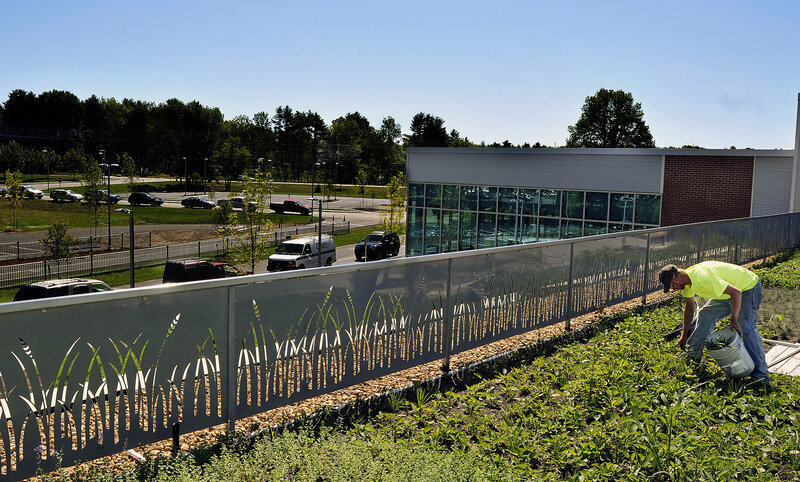 The overall design themes of grasses, water and woodlands are reflected in the three wings of the new school. Floor tiles and lockers are in jewel tones of blue and green. Stainless steel railings are cut in a seaside reed pattern. Doors throughout are light birch, the spiral staircase in the two-story library is rimmed in light maple and the ceiling in the cafeteria features strips of Maine white cedar set in a wave pattern that calls to mind the bottom of a boat. The school has 72 classrooms and instruction spaces, with younger students on the first floor and older students on the second floor. Each classroom has white boards, an LCD projector, document camera and sound amplifying system. The district decided to issue iPads and laptops to students rather than have computerized white boards, Powers said. Each kindergarten classroom has a bathroom and sink, which is important now that the district is providing full-day kindergarten for all students, Powers said. In addition, two classrooms are dedicated to a new day-care program for preschool children of staff members and students. Twenty-two children have enrolled in the cost-neutral program, which has three staff members and costs $185 per week. The new school features a gymnasium with lockers that is connected to a multipurpose room, both of which have their own lobby so they can be used for community events. It also has a nurse’s suite, including two offices and a bathroom. The front lobby has a modern security system and features a federally funded public art project created by Sean Foley, a former instructor at the Maine College of Art who is a visiting professor at Ohio State University. 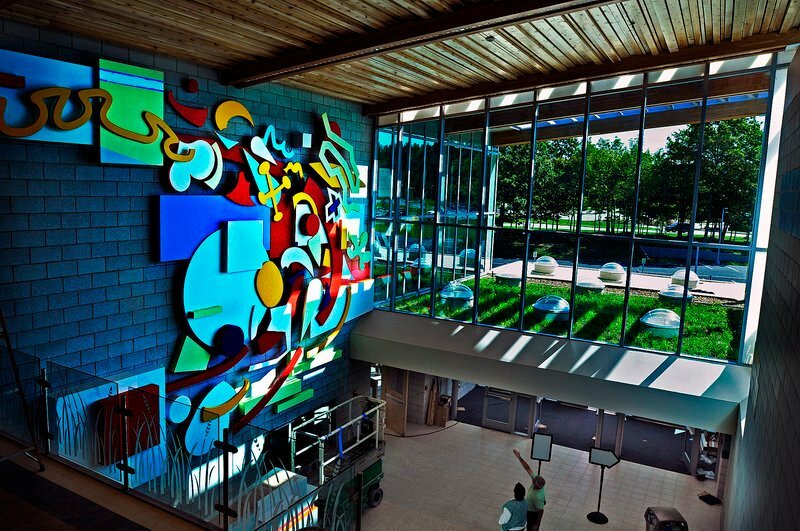 The 30-by-25-foot wall sculpture is a dynamic collage of different shapes and colors that change when viewed from different perspectives and when sunshine spilling through tall windows shifts throughout the day. The sculpture includes an interactive display area at floor level where students can show their work.